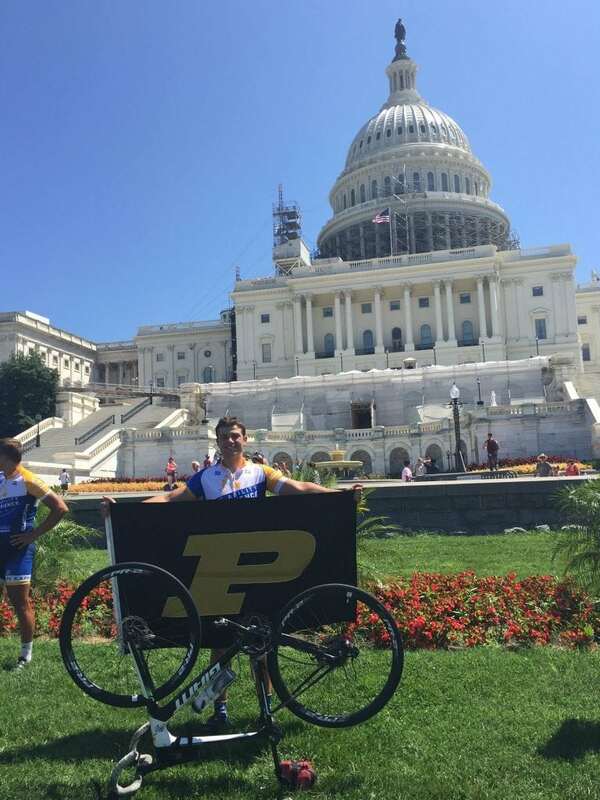 In the summer after my sophomore year I participated in Pi Kappa Phi’s Journey of Hope. This was a 3600 mile cross-country cycling trip where I raised over $6,000 personally for The Ability Experience and spent 2 hours every day all summer volunteering with people with disabilities. Nate in Washington, D.C. after cycling across the U.S. with Journey of Hope. Post-Graduation Plans: I hope to work in management consulting. I will be interning this summer with West Monroe Partners in Chicago, and would love to continue on with them full time after my graduation in December 2018. Originally, I started doing dance marathon through my fraternity, and, in all honesty, I wasn’t the greatest participant my first few years. All in all, I was really just going through the motions up until my third marathon. At that marathon, it finally clicked–while looking around at the faces of over a thousand of my peers and hearing the family stories–that I could use my talents to actually make a difference. This realization is what led me to applying for an external exec, and then to be VP External. I realized that I could take what I have been learning as a marketing major and do something meaningful with it. I love marketing and talking to people, and Dance Marathon lets me do that in a way that saves lives. How I look at it now is that every person who joins Dance Marathon puts us that much closer to a day without sick kids. I can spend hours writing on chalkboards or handing out flyers because if it gets that extra person to join, it’s all worth it. I do Dance Marathon because it gives me the chance to do what I love in a way that makes a difference unlike anything else I could have experienced in college. I hope to continue to be able to support Dance Marathon after college for that same reason of giving more students the chance to develop themselves while changing the lives of kids in their community. Dance Marathon is, in my opinion, one of the single greatest experiences you can have in college. It is one of the few campus organizations where you can have full ownership for a large organization and directly see your impact year to year, regardless of your major. Whether you enjoy photography, or web design, or marketing, or accounting, or event planning, or any number of other things Dance Marathon allows you to take those interests and apply them in a way that is saving lives. Even if your major isn’t related to any of those skills, Dance Marathon gives you an incredible amount of leadership development. You get to work year round with some of the most driven people on your campus to plan and execute every aspect of a nonprofit organization that, in some cases, raises as much as a $4 million. It gives you an incredible amount of community, experience, and leadership development–all as a college student. In addition, Dance Marathon gives students the opportunity to make meaningful relationships with their fellow students. Whether you are an engineer or nursing student, Greek or Independent, Domestic or International student, you can join Dance Marathon. Because of this inclusivity, DM gives you the chance to interact with many students that you otherwise wouldn’t meet. From yearlong planning to the big event, you’ll be surrounded by students from all walks of life passionately doing their part for the kids. I know I’m not alone when I say I’ve met some of my best friends through Dance Marathon. Lastly, Dance Marathon gives you a way to develop skills and make friends for a meaningful cause. One of my favorite quotes is, “For many, college is some of the most selfish years of your life. Dance Marathon allows you to make it some of the most selfless instead.” No matter what level of Dance Marathon you are doing, you are taking time out of your busy schedule to make a difference in the lives of kids. Through their work, students can give the next generation the chance to have the same experiences they have had. There aren’t many other experiences that can give you as much as Dance Marathon, while also giving you the chance to give back in return. Dance Marathon has been the single most impactful experience I have had as a student. 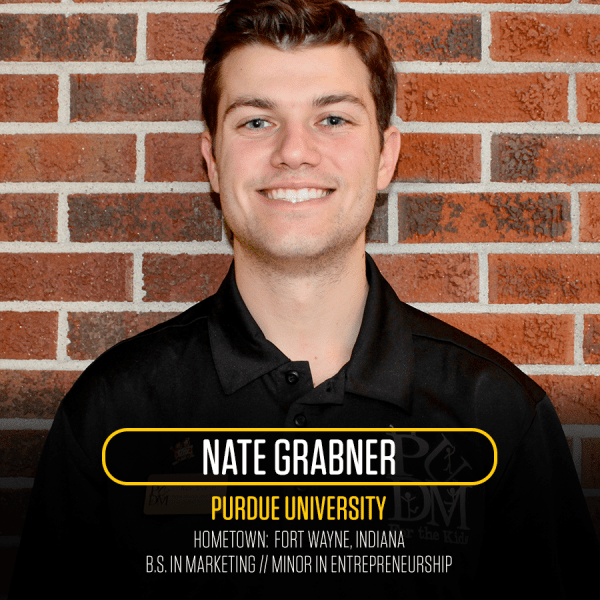 It has allowed me to take what I learn in my marketing classes, then turn around and directly apply them through my positions on our external team. At a more concrete level, I’ve learned pricing strategy and how to source the best materials for the cost by working with merchandise, I’ve improved my Adobe Suite skills by helping our productions teams, and I’ve learned WordPress, Hootsuite, MailChimp, and numerous other marketing tools by helping our PR team. In addition, Dance Marathon has developed me as a leader. I’ve learned how to manage a committee of 100 people and motivate a group of 6 execs. No matter how good the plan is, and how much the numbers make sense on paper, you can’t be successful without your people. They are your most valuable resource, and Dance Marathon is what taught me that. I managed to land a job with my dream company this summer, and they told me my experience with Dance Marathon is what made me stand out above all else as an applicant. 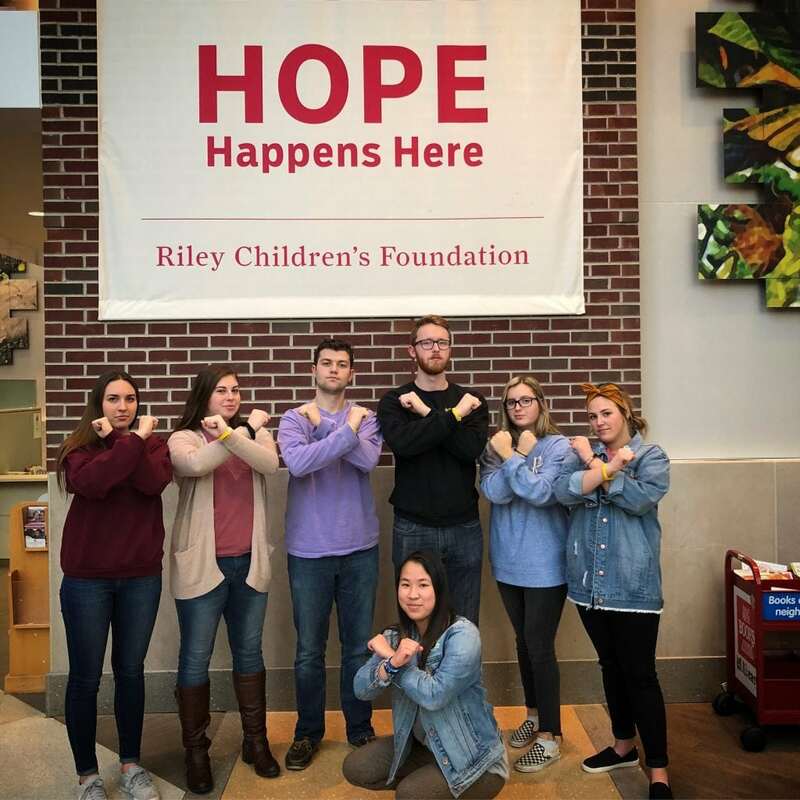 Nate with the External Team from the Purdue University Dance Marathon executive board at Riley Hospital for Children. As a member of PUDM, I am a little unique in that we have a Fall marathon and my final one as a VP is yet to take place. As we inch closer to that date I hope to, along with my team, continue to have more and more accomplishments. To date, my proudest accomplishment so far with Dance Marathon has been seeing the total number of people who checked into PUDM 2017. We had been stagnant at about 1,150 people attending the marathon for 2014-2016. I set out in 2017 with a goal of changing that. I worked throughout the year recruiting dancers, and then spent dozens of hours in the weeks leading up to the marathon corresponding with those dancers and my team captains to make sure they were prepared for the marathon. I was incredibly proud to see this work pay off when we not only broke the record for most Greeks registered (I was Greek Outreach exec), but also broke the check-in record at the marathon by 200 and had the most people we’ve ever had attend the marathon in 2017. No person ever expects their child to get sick. When people decide to have kids, they think about birthday parties and college graduations. They think of family vacations and walking those kids down the aisle at their wedding. Every kid should have the opportunity to do those things just as much as every parent should be able to see their child live a full and happy life. People should donate to their local CMN Hospital to give every parent and every kid the chance to celebrate more birthdays. I think one of the greatest decisions CMN Hospitals has made is to honor champions instead of focusing on the illnesses faced by children in the hospitals. The kids helped my local CMN Hospital are going on to do incredible things, and by donating you are giving kids like them the chance to keep doing those incredible things. All it takes is standing out in a busy city canning for donations for a few hours to hear dozens of stories from the people walking by about how CMN Hospitals have changed the lives of them and their children. If someone’s donation can buy just one more day of happiness for a child, it’s all worth it. Previous post: Crane Credit Union is FTK!